Richly decorated elephants, as seen during the Thrissur Pooram are now globally recognized as a symbol of Kerala and Elephants .Elephants in Kerala are often referred to as the “sons of the sahya”. As the State Animal, the elephant is featured on the emblem of the Government of Kerala state, taken from the Royal Arms of both Travancore and Cochin. 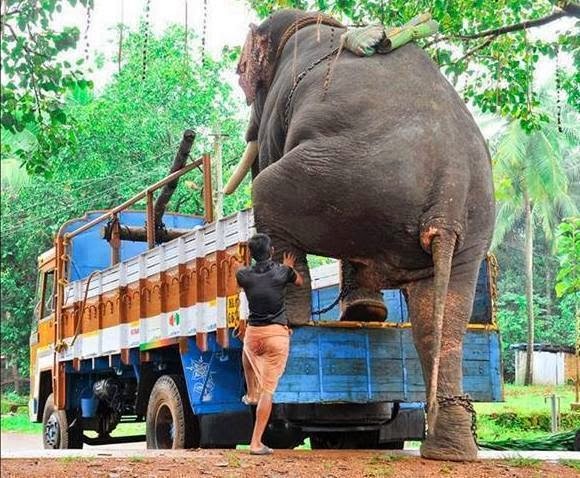 Here is a viral snap of elephant being transported in Kerala for processions and festivals. Here are some more Kerala Elephant Photos taken at Punnathurkotta in Guruvayoor. Punnathurkotta houses elephants of Kerala belonging to the Guruvayur temple and in this 10 acres facility which is used to train elephants to participate in religious festivals throughout the year there are nearly 65 elephants now. Punnathurkotta is now a training school for mahouts and the compound also has a nalukettu, a traditional rectangular home with a central courtyard, which belonged to the Punnathur Raja. Here are some Photos of Elephants of Kerala from this amazing training ground that is a symbol of relationship between animals and humans.